• Go outside and look at the roof. Are the shingle lines still straight or can you see sags or other irregularities? A sag would indicate that the sheathing underneath is rotting. • When you clean your gutters (which you should be doing twice a year), do you find a lot of asphalt granules in the gutter? • Do you see cracked, curled or misshapen shingles? As shingles age they begin to deteriorate. • Go up in the attic, preferably during or immediately after a good rain, and look for evidence of leaks. Getting a new roof requires a considerable investment, so it is understandable that many homeowners put off the decision to do this for as long as possible. However, if you replace your roof when the damage is already extensive, other parts of your roofing system, including the flashing, gutters, and even your ceiling, might also already be compromised. Likewise, it will be more difficult to lay a new roof over an existing one that has already deteriorated extensively. The most popular type of roofing in the country is asphalt shingle, which has a typical lifespan of 20 to 25 years. However, constant exposure to extreme weather conditions, such as those experienced in Illinois and Indiana, can hasten its deterioration. This is even likely to be accelerated further if a roof is not properly maintained. 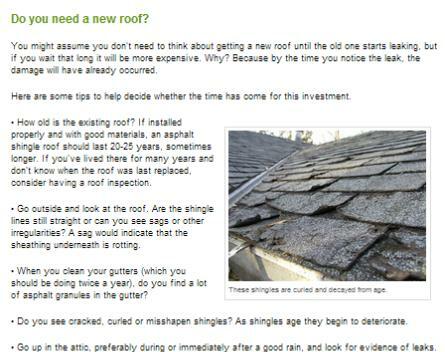 If your roof is nearing the end of its service life, and an inspection reveals the signs of damage outlined in the AngiesList.com article, ask Rogers Roofing to make an assessment of your Munster or Crown Point, IN roofing situation. Roof replacement can be done either by tearing down the existing roof completely and installing a new one, or by putting a new layer over the existing one. Roofers generally recommend the first option, but agree that overlaying may also be reasonable because it is a far less expensive alternative. Reputable Crown Point and Munster roofing contractors, like Rogers Roofing, can help you in assessing and determining the better way to replace your roof if the need for it has become imminent.